Weatherproof rugged all-metal 12-button keypad. 2 alarm zone shuning or lock release by real-time schedule. * Timed egress input allows door open for 5, 10 or 15 seconds. * Ideal for use with 12V or 24V (AC or DC) electric door strikes, mag lock or Alarm Lock Remote Release Mag Lock Kit. * Easiest installation in minutes: Wall mount or single gang box. * 40,000 Event Audit Trail: Query by PC or Handheld Printer or DTM Module. * Real time clock with time-zone adjustments, enables 500 scheduled or holiday events. * Remote-Release Feature/Request-to-Exit Input. * Independent Tamper-Report attempts to vandalize or remove DK3000 via an alarm system. * Accepts most HID proximity cards and keyfobs. 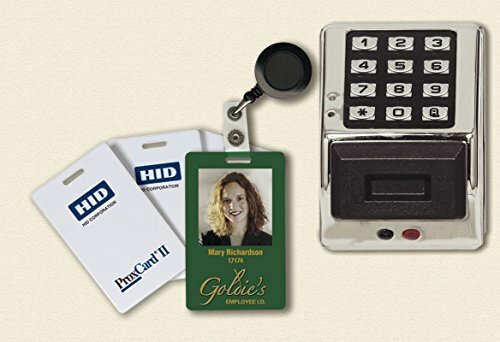 * Users are individually programmed to use a card only, code only or for the highest security both card and code. * Prox card data can be added to software by uploading from keypad by using AL-PRE or entering directly from computer using DL-Windows software. * Metallic Silver, Duronotic, 26D Dull chrome finish. View More In Electromagnetic Locks. If you have any questions about this product by Alarm Lock, contact us by completing and submitting the form below. If you are looking for a specif part number, please include it with your message.